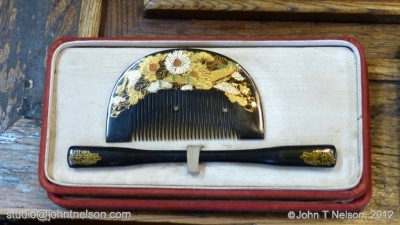 It’s a gorgeous, sunny day in Tokyo and John is out and about, shopping for “kogai” hair sticks and “kushi” hair combs for a friend back in the States. What better place to start than Nakamise Dori in front of Sensoji Temple, Asakusa! After a hearty breakfast of onigiri from Lawson’s with the lunch time crowd on the nearby park benches, I begin today’s subway journey with something new: a Tokyo Metro One Day Pass. This pass allows you unlimited travel on Tokyo Metro lines as well as Toei busses and Toei subway lines. I hop on the Oedo line train bound for Karamae where I have to walk a block to change trains to the Asakusa line. Oh look, there’s a Toei bus stop right outside the station, what a surprise. Before changing trains I run across a nifty toy store that sells tons of children’s toys, scale model kits and N gauge model railroad trains. They also do wholesale business. Needless to say, I have to pick up four N gauge locomotives [ although at a significantly higher price than if I had purchased them at one of the stores on Nakamise Dori ]. I change trains to the Asakusa line and it’s only one stop to Asakusa station, but unlike the Ginza line, this station stop is a couple blocks from the Karimarimon Gate in Asakusa. I walk the back streets of Asakusa and a large covered shopping arcade. … and the snowball starts rolling. From there phone calls are made, maps are consulted, the owner of the shop arrives to add his opinion, and a thick Asakusa guidebook is annotated with PostIt notes to direct me to a few antique dealers. Then I meet Yuki, a Japanese woman with excellent English language skills, who is picking up a special order from this shop. She proceeds to act as translator and offers to guide me to a couple of these antique shops. One of them will see you by appointment-only, so an appointment is made and Yuki and I stroll through the Sensoji Temple complex on the way to these antique dealers, first to a stall where antique kanzashi (as well as old kokeshi dolls) are sold. We then head to the appointment-only antique store on the far side of Sensoji which houses the hilts of samurai swords, armor, expensive china and ancient ceramics. We are seated in comfy couches and served hot coffee before the antiques master who has several very expensive antique koogai and kushi sets waiting before us. Absolutely lovely pieces and all of them true antiques. Yuki translates between myself and the antiques master and his wife who is seated on tatami mats in the space that serves as their office. I feel like I’ve just turned Japan on its head with this one simple goal and entered another world. It’s also emblematic of how things are done in Japan… the word of a friend… a phone call… a personal meeting. 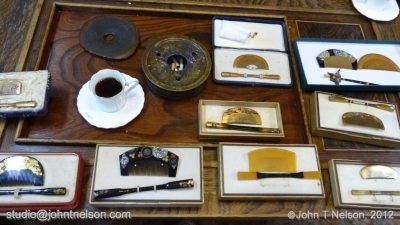 We discuss prices (which are reasonable) but I’m reluctant to purchase such expensive items for a friend whose budget doesn’t include Meiji Era antiques. I defer and agree to meet with the antiques master at his shop tomorrow, when he says he will show me a few, more appropriate pieces. Yuki and I say goodbye to the antiques master and chat as we wander back to Nakamise Dori where we wander into several shops … and then the the time comes for us to go our separate ways. I am indeed fortunate to have made a friend whose bilingual skills made this experience enjoyable and memorable. Helping each other to extremes seems to be an obsession with the Japanese and it’s the oil that keeps their society and communities running, everyone doing his part to keep the karma bank full. I hang about Sensoji taking photographs and recording some video footage of the lovely twilight sky against the temple gates and Tokyo Sky Tree just across the river. Instead of the Asakusa line, I take the Ginza line back to Monzen Nakacho, the total time from station to station, a little more than half an hour. Its also time for dinner and what better place for dinner than Yoshinorya, right next door to the subway exit and I do mean right next door. I have beef curry and rice with a soft boiled egg and a bowl of miso soup. I wander down to “the other side” of the Pachinko parlor to score some fresh baked pastries and noticed the food vendors are setting up their stalls on the sidewalks. Serendipity, the way it works for me in Japan, has set up an imagawaki vendor for me… fresh grilled pancakes filled with sweet red azuki bean paste, yum!